A few weekends ago I joined the fine folks from HogHaven.net, a great source for all your motorcycle camping gear, on their season opener camping event. The main group rode up from their store in Clover, South Carolina and I rode solo over the mountains via the Blue Ridge Parkway (BRP) to converge on the Riders’ Roost in Ferguson, North Carolina. The weekend was forecast for rain, rain and more rain, which kept some folks from riding. As it turned out there was nary a drop of rain that fell on any rider going up; ya’ll should have been there. I can only speak for myself but the same was experienced on the ride back home. It can get colder than you might expect at the highest elevations along the BRP. Darn good thing I had left the winter gloves and a flannel lined leather bandana in one of the saddlebags on the Road King. I actually wished for my electric jacket liner, but the Vanson Leathers thermal vest along with a thick sweatshirt kept me warm enough. The Riders’ Roost is a very cool place to spend the weekend or longer camping. This time (my first visit) I enjoyed a cabin right next to a small river and a roaring waterfall. The sound of that waterfall was perfect to lull a biker to sleep. While it did rain late at night, the sound of that rain on the tin roof was also enjoyable. The combination of leftover rain dripping from the trees on to the roof blended with the waterfall roar the next morning to sound like a mighty storm. Sunday was however very pleasant once I rolled out of my sleeping bag and opened the cabin door. The accommodations were clean and well kept as was the whole facility; the Riders’ Roost crew does a nice job of making it a comfortable place to visit. I can easily see returning there and making it a cozy base camp for exploring more of that part of the Western North Carolina (WNC) mountains. It is fairly remote being between Lenoir, Wilkesboro and Blowing Rock. There is a gas station with a convenience store a mile or so away and a small store on site. While everyone else was enjoying a fine dinner of fried catfish, French fries and hush puppies cooked up by Brett & Vanessa Causey, owners and operators of hoghaven.net, I settled down to cook my own dinner. Being a vegetarian catfish was not on my personnel menu, but everyone else enjoyed it. Nothing like well fed bikers. I took advantage of this situation to get a little quiet time at the picnic table by my cabin, which afforded a great view of the waterfall, and to cook my simple dinner. While I had my JetBoil stove along with a GSI Backpacker Meal Set in which I could have cooked a fine meal for two, I opted to use a much more compact set-up. I had decided that a big bowl of lentil soup along with some cheese and whole grain bread would be a perfect quick meal. Minimal cooking and cleanup so I could get back to the festivities well nourished, and I had the perfect piece of kit on the bike. 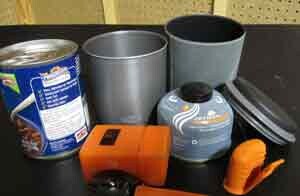 The Minimalist Meal Kit and the Hog Haven Mini-Stove, these two along with a fuel canister will pack down to about the same size as a can of ready to cook soup. Yeah I know I am the recipe man able to whip up fantastic meals along any roadside stop. But some days you just need simple, fast and compact heating of prepared foods. I will however share a recipe (or a few) that work great in this little cooking marvel in a future blog. Fortunately when I stopped for gas in Blowing Rock I found the fixin’s for a simple but satisfying meal. I had planned on buying some more exciting stuff and making a little Mexican themed feast, but such is life. The big idea that came from using this set-up is simple. While you can’t bring the kitchen sink you sure can be prepared to cook dinner anytime you ride. I am of the mind now that this little marvel should be in the saddlebags any time I head out for a ride. One never knows when a storm could force you to layover for the night unexpectedly. While you might find a room, you may not find an open restaurant; but almost every gas station these days sells convenience-sized foods. With this kit you can enjoy a warm meal, or even heat up a container of chocolate milk for some back roads cocoa while you sit out a cold rain. I will also make sure I have some of those Folgers coffee in a tea bag so I can get a hot cup of “brewed” Joe at any scenic overlook. Well so much for camping and cooking. I also wanted to mention the great Old Time biker party we had. We had rock’n roll music along with good time country music, cold beverages, pool to shoot and lady bikers dancing the night away. Tall tales were surely told and I think I saw a jug of homebrew floating around or maybe it was just apple cider. No way of knowing now. A new twist was a karaoke screen for those who needed the lyrics to sing-along to, but everyone there knew the words to the classic David Allen Coe songs. A fun time was had by all, good food, good company, decent weather despite the forecast and good roads to ride. Till next time – Eat Hot & Ride Safe! Hog Haven Mini-Stove looks like the ideal portable camp cooker. .I’m sure your meal was just a delicious as the cafe bought grub!